American grasshoppers (Schistocerca americana) live throughout North America, Mexico and the Bahamas and can be raised pets or farmed. They are large for insects, and they have powerful hind legs that allow them to jump long distances. Despite their size, they are herbivores. Get a gallon jar or aquarium and a wire mesh screen for the lid. Make sure mesh is small enough that tiny baby grasshoppers can't jump through and escape. Use a normal light bulb or lamp for a radiant heat source. Ideally you should place it inside the tank or at least close. Keep the light on for about 16 hours a day. Keep a cup of slightly moist (not soaked) sand for the eggs to be laid in. 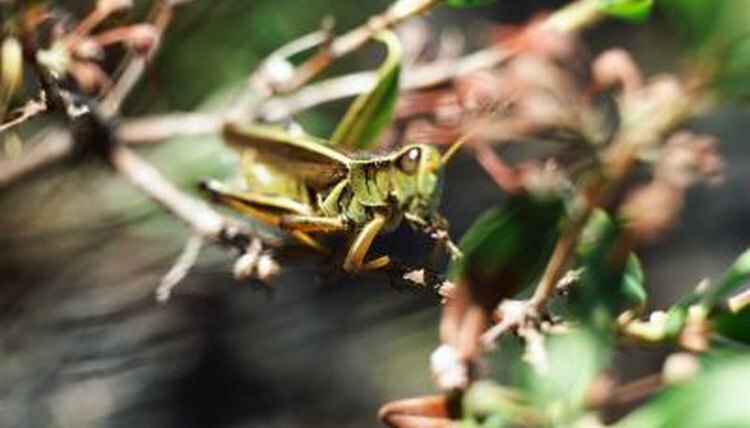 Feed your grasshoppers a mixture of greens like cabbage, nightshade, lettuce or grass. Use a variety of vegetation. Wash the greens first so all the pesticides and residues are completely removed. Keep a capful of bran or wheat germ in the habitat as well so they will have some dry food to munch on. Grasshoppers do not need to be watered as long as you provide them with fresh food and bran. They get their hydration from their food and do not require further sources for water. Keep the humidity of the habitat low and the tank dry. Grasshoppers will lay their eggs 2 to 3 cm below the surface of the sand you provide them because they prefer to have some ground to cover the eggs. They lay 60 to 80 eggs at a time in a frothy cluster. Incubate the eggs at 83 degrees Fahrenheit. The eggs will hatch three to four weeks after they have been laid. The baby grasshoppers, or nymphs, will push their way up to the surface after hatching.